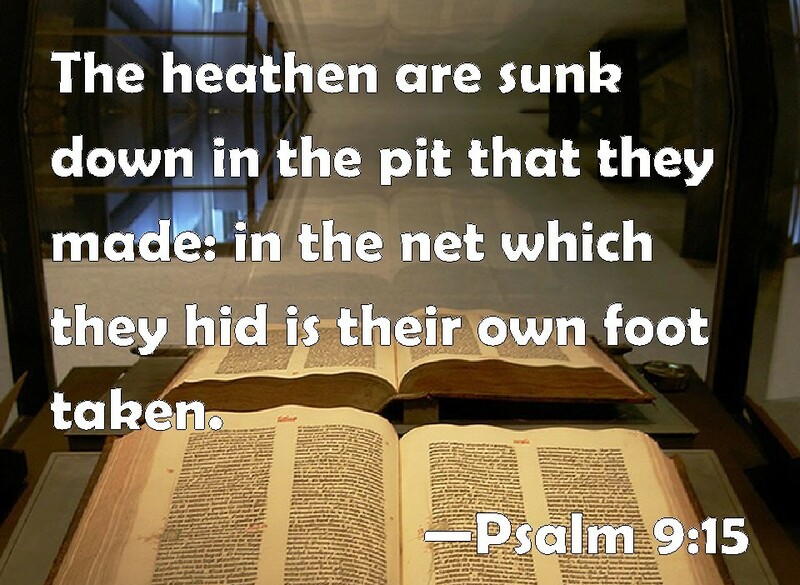 The wicked think they are clever by setting others up thinking God is oblivious to their actions,but scripture tells us God is very aware and although the wicked set a net it is their own foot that is taken by it (Psalm 9:15-17). 15 The heathen are sunk down in the pit that they made: in the net which they hid is their own foot taken.16 The Lord is known by the judgment which he executeth: the wicked is snared in the work of his own hands. Higgaion. Selah.17 The wicked shall be turned into hell, and all the nations that forget God. In Psalm 35 we can hear just how David had enemies surrounding him,yet he asks the Lord to confound them and put them to shame among other things including to let the net they have set for him that their own foot be taken! (Psalm 35:4-9), 4 Let them be confounded and put to shame that seek after my soul: let them be turned back and brought to confusion that devise my hurt.5 Let them be as chaff before the wind: and let the angel of the Lord chase them.6 Let their way be dark and slippery: and let the angel of the Lord persecute them.7 For without cause have they hid for me their net in a pit, which without cause they have digged for my soul.8 Let destruction come upon him at unawares; and let his net that he hath hid catch himself: into that very destruction let him fall.9 And my soul shall be joyful in the Lord: it shall rejoice in his salvation. (Psalm 57:6). ← Handle ME+ … and See !